If you’re having a major breakout, or just tired of the everyday pimples on your face, you can get a deep cleansing treatment to take care of the problem. If you’re not sure where to find the best spa, clinic, or esthetician, you can search for “acne facial near me.” The results in the list should point you in the right direction. Who can do an acne facial for you? Some spas offer this service. So do estheticians in some beauty salons. You might also get this treatment at a dermatologist’s office. You can check on the map to see which places are closest to where you are. When you have an acne facial, you can expect a deep cleansing of your skin. The esthetician will probably open up your pores with steam, exfoliate dead skin, extract blackheads and treat pimples, apply a final cleaner, and moisturize your skin, perhaps with a healing mask. They may offer additional services like chemical peels with glycolic acid. The facial doesn’t just clean, it also helps prevent new acne flare-ups. When you arrive for your first facial, you’ll probably have to answer some questions. The spa or clinic will want to know if you have any allergies or if you’re taking any medications for acne. They may ask how you care for your skin. Talk with them so they can customize their treatment specifically for you. Generally speaking, acne facials and deep cleanses work best on patients with certain types of acne like blackheads, occasional blemishes, and oily skin. People with severe cystic or hormonal acne might need to be treated by a dermatologist. When do I need a dermatologist instead of an esthetician? When you visit a spa or salon for an acne facial, they may recommend that you visit a dermatologist. A dermatologist can pin down the reasons why you’re suffering with acne and make recommendations for treatments to resolve it. They can prescribe medications and suggest non-prescription solutions. They may also have equipment in their office to perform blue light therapy or laser derm-abrasion. The LightStim for Acne has been cleared by the FDA for treating mild to moderate teenage/adult acne and skin blemishes. The blue LED lights that kill acne-causing bacteria and reduce inflammation won’t burn your skin. It won’t damage your skin or dry it out like some medications and chemical treatments. This device is painless to use and doesn’t take much time or effort to use. At only 3 minutes or less per session, and only two to three sessions a week, it’s a breeze to fit it into your schedule. The LightStim handheld device comes with a 90-day satisfaction guarantee. If you don’t see results, you can return it for a refund. It also comes with a lifetime no-questions-asked warranty. Getting just one acne facial may resolve the pimples you have today, but you may break out again. Many patients have to return for additional treatments. That’s why you want to choose a good spa or salon or clinic right at the start. You want a facial that clears up the problem now as well as a trustworthy place that will take care of you in the future. Acne facials may cost as much as $100 or more. How can you find one you can afford? Places that offer cheap facials may provide only a basic skin cleanse or use inferior products. Their staff may not have the in-depth training of employees in other spas, salons, or clinics. If you want the best deep cleanse for your acne, you may have to shop around. Start with the list of places you find. Check their prices and services. Do they offer discounts or deals? See what steps they use to perform a facial. What products do they use? Read online reviews carefully. See if any of your friends have done a facial at the places you’re considering. What did they think? In the meantime, you can save money by showing your skin some loving kindness. If you take care of your face properly, you may be able to extend the amount of time between facials. Try out some high quality products to keep your acne at bay. If you’re on the lookout for skin care products that fight acne, here are a few suggestions. Until recently, you had to get a prescription for strong anti-acne medication. The Neutralyze Moderate to Severe Acne Treatment kit is a powerful over the counter solution that wipes out pimples and other skin problems. Besides acne, you can use it to treat eczema, psoriasis, hyperpigmentation, and even razor bumps. The formula uses a solution of 1% salicylic acid and 1% mandelic acid to reduce inflammation, unclog and shrink pores, and get rid of dead skin. It also balances the pH or acidity of your face and helps prevent future breakouts. It was clinically tested and proven to be 95% effective, clearing up your skin after only a few days. The kit comes with Face Wash, Clearing Serum, and Neutralyzer/Synergyzer. There is a one-month supply in the box. A face mask can heal your skin. Depending on the ingredients, a good mask can soothe irritation, moisturize, and exfoliate dead skin. If you would like to try a very natural mask that will clean out your pores and cut down on oiliness, the Aztec Secret Indian Healing Clay is a very popular product. It’s basically a jar of pure Bentonite clay from Death Valley, California. You mix it with water or organic apple cider vinegar, apply it to your face, let it set for up to 10 minutes, then wash it off. Pure Body Naturals makes it possible to bring the spa home with you. Their Dead Sea Mud Mask is made to purify your skin, shrink your pores, and hydrate your face. You can use the mud on other parts of your body, too, like areas where you have cellulite. But what if there isn’t a place for acne facials near me? 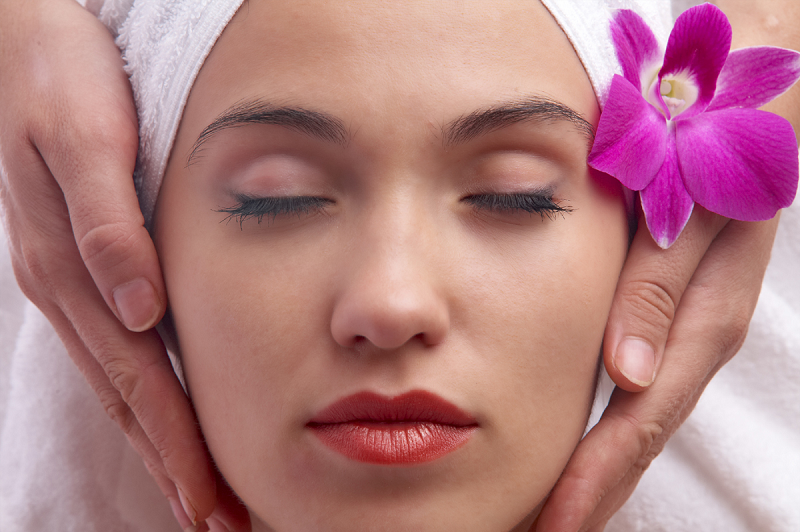 It may happen that you can’t find a place that does acne facials in your area. Or it may be that you can’t find one you like or can afford right now. You can still take great care of your skin. Try some of these natural methods to give yourself a facial at home. Start a skin care ritual at home. Once a week, boil a pot of water, turn the heat off, then place your face about a foot above the water. Drape a towel over your head to trap the steam inside with you. Stay there about ten minutes and enjoy. You can add essential oils to the water, too. You might appreciate tea tree oil (Melaleuca), lavender, green tea, or chamomile. After steaming, make a mask for your face. If you don’t have Bentonite or Kaolin clay, try making a mask with honey, milk, and plain yogurt. Milk has lactic acid that gently exfoliates dead skin. Honey fights bacteria and inflammation. Yogurt is a natural wrinkle-fighter. These three together can work wonders. After ten minutes, rinse off your mask with warm or cool water, then wash with your favorite face cleanser. Pat your skin dry, apply a toner if you use one, then always apply moisturizer.